Over the years, the interiors of film have played a huge role in creating atmosphere, setting scenes, and in some cases, becoming a character all of their own. To celebrate the release of thriller The Loft (which features a slick, stylish high-rise apartment that takes centre stage), we take a look back at some of the other best apartments on film. Audrey Hepburn’s iconic turn as the effervescent Holly Golightly is arguably her most memorable role- but the stunning interior of her NYC brownstone apartment cannot be forgotten as a major supporting part. Inspiring a thousand copycats, the inside of the eponymous party girl’s home features the instantly recognisable half-bathtub sofa, satin cushions and NYC flea market finds galore, a plush tiger skin rug and, of course, Cat. 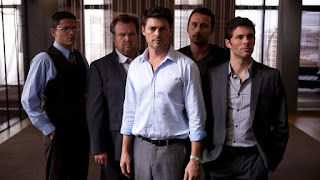 Not strictly an apartment, but worthy of a place on the list nonetheless, the stunning John Lautner house used as the backdrop to this critically acclaimed drama is only one aspect of an entire film that maintains an achingly cool level of style throughout; no great surprise, given that it was directed by Tom Ford and the production design came courtesy of the geniuses behind Mad Men. Bruce Wayne’s sleek, minimal Gotham penthouse is the backdrop to a large portion of The Dark Knight, as Wayne Manor is still being reconstructed following the events of Batman Begins. Moody lighting and the steel-gray and chrome interiors lend to the films overall look of a city on the brink of utter desolation, with the ever-present looming threat of Heath Ledger’s Joker. 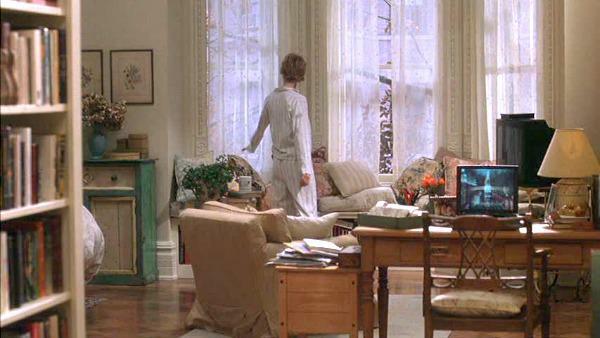 Meg Ryan's beautifully cozy NYC brownstone paints a gorgeous, if somewhat unrealistic picture of New York studio living. The interiors are wonderfully feminine, with vintage dressers, lace curtains and an abundance of flowers throughout, all pitched perfectly against the ever-present backdrop of the newly arrived technology that is seeping into everyday life. 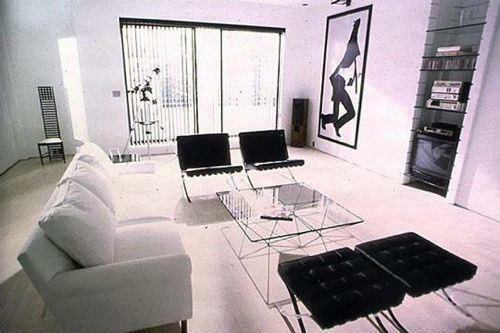 Patrick Bateman’s apartment is a masterclass in minimalism, with sleek lines, all white furniture, and barely any colour. Production designer Gideon Ponte and set designer Jeanne Develle went to great lengths to ensure that the apartment remained clinical and nothing looked too lived-in or comfortable; of course, adding to the effect of one particularly grisly scene that takes place within the pristine walls. Alfred Hitchcock’s masterpiece opens with Scottie Ferguson (James Stewart) realizing he suffers from vertigo, and retiring from his position as a private investigator, only to be lured into another case by his old college friend, Gavin Elster (Tom Helmore), who wants his wife, Madeleine (Kim Novak) followed. 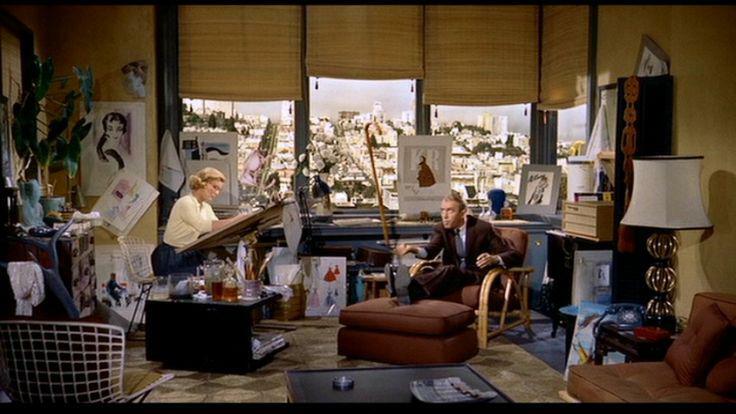 Scottie seeks solace with his ex-fiancee Midge (Barbara Bel Geddes), and her much-coveted, bric-a-brac filled apartment boasts some incredible views of New York City, looking west to Russian Hill from the top of Union Street on Telegraph Hill. Penny Marshall’s classic 80’s fantasy stars Tom Hanks as Josh, the young boy who wakes up to find himself transformed into a grown man, leading to all manner of high jinks. Josh’s new ‘grown-up’ Manhattan loft taps into the child in all of us- complete with a basketball court in the hallway, a pinball machine and a trampoline in the living room. The apartment Carrie Bradshaw (Sarah Jessica Parker) shares with Big (Chris Noth) in this sequel based on the HBO series beautifully reflects both of their personalities, combining old-school charm with up-to–the-minute stylish pieces. Set decorator Lydia Marks took inspiration for the apartment’s architecture from classic films, including Alfred Hitchcock’s back catalogue, in order to give the apartment a ‘proper NYC’ feel. 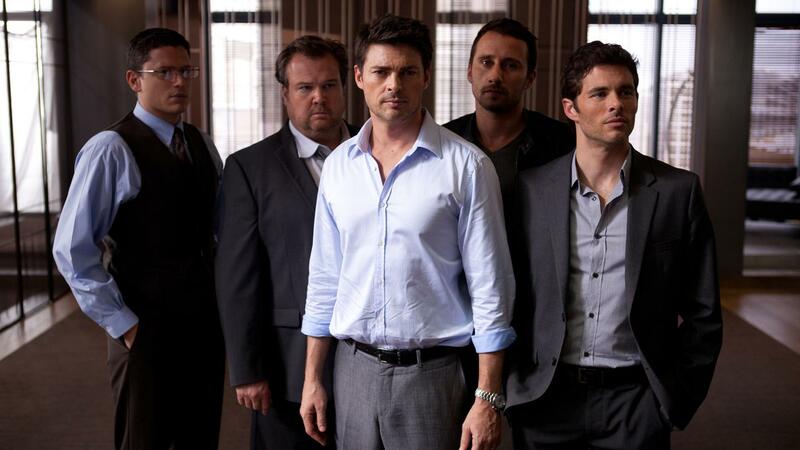 THE LOFT is released on digital platforms from June 8th, 2015 and on DVD from June 15th 2015 courtesy of Signature Entertainment.